This paperboard product container was photographed on a white background. Designed for long-term storage, this paper storage tube provides consumers with a convenient access to a popular product. This product photo was created for use in online ecommerce and for retail distributors. 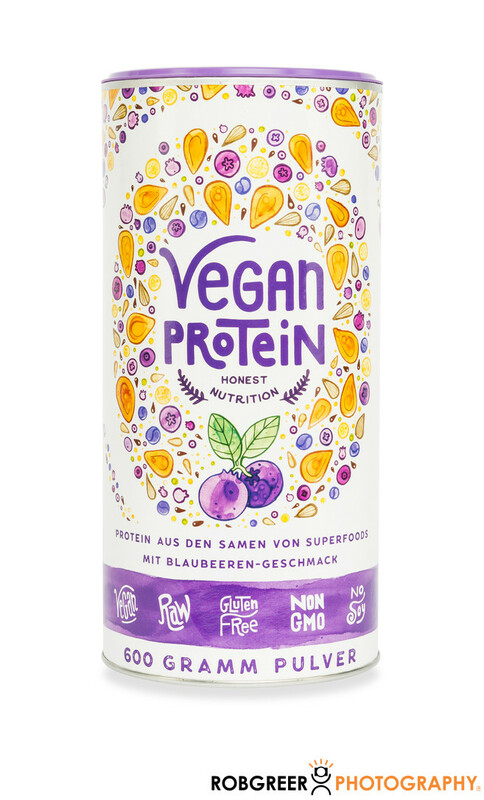 This packaging example showcases a vegan protein powder distributed in Germany. Future plans for this healthy lifestyle company include expansion into USA markets. Sustainable paper containers like these are rigid and are available in a wide range of diameters and heights. They typically contain food, beverage, and non-food products. However, there is often a barrier liner between the paper and the container contents. This kind of packaging is an ideal replacement for tinplate containers. Corner-free paperboard tubes are made of recycled materials and often include a plastic cap available in multiple colors as seen in this example. Other containers may include a membrane that can be peeled by consumers. Although most of these cardboard containers are round and cylindrical, other options include oval, rectangular, or even square packaging. I have experience photographing packages of of differing shapes and sizes and would love to have an opportunity to bid on your project. The paper label for this container is non-reflective and opaque allowing for relatively easy camera capture. It was photographed on a white seamless background to allow for easy use across most ecommerce platforms. Although this product proved relatively easy to photograph, glossy paper labels or highly reflective papers or foils can be more difficult to capture without glare or reflection. If you like my work and you'd like to discuss your paper container product photography project (or any photo project) in greater detail, please contact me today. 1/200; f/14.0; ISO 100; 60.0 mm.